The Duke of Leeds reported from the Lords Committees to whom the Bill, intituled, "An Act for naturalizing John Richard Brinckman Esquire," was committed: "That they had considered the said Bill, and examined the Allegations thereof, which they found to be true; and that the Committee had gone through the Bill, and directed him to report the same to the House, without any Amendment." Hodie 2a vice lecta est Billa, intituled, "An Act for dividing and enclosing several Open Fields, Pastures and Commons, in the Townships of Great Driffield and Little Driffield, in the County of York; and for settling certain Yearly Payments to the Prebendary of Driffield for the Time being, in Lieu of his Tithes, pursuant to an Agreement and an Award made for those Purposes." Vis. Harcourt. L. Bp. Durham. Their Lordships, or any Five of them; to meet at the usual Time and Place, on Thursday the 5th Day of February next; and to adjourn as they please. 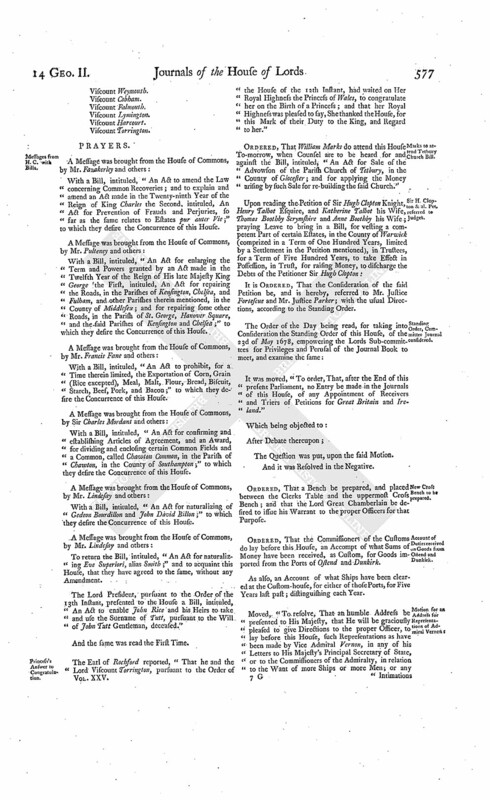 It is Ordered and Adjudged, by the Lords Spiritual and Temporal in Parliament assembled, That so much of the said Interlocutor of the 21st of December 1739, whereby the Lord Ordinary did advocate the Cause, be, and the same is hereby, affirmed; but that the Residue of the same Interlocutor, as also the Interlocutor of the Lords of Session of the said 14th of December 1739, and their Interlocutor adhering thereto, of the 21st of the same Month, be, and the same are hereby, reversed: And it is hereby Declared and Adjudged, That the Disposition granted by the Appellant's Father, of his Land Estate, to the Appellant, does not exclude him his Share of the Provisions stipulated by his Father, in his Contract of Marriage, to the Children of the Marriage: And therefore it is hereby Ordered and Adjudged, That the Appellant do retain so much thereof as will compensate his Share of the Twelve Thousand Merks provided by the said Contract; and that, in order to ascertain the Appellant's Share thereof, both Parties do inform the Court of Session thereon, according to the Course of that Court; and that the said Court of Session do proceed thereupon according to Law and Justice. Dominus Cancellarius declaravit præsens Parliamentum continuandum esse usque ad et in diem Jovis, vicesimum secundum diem instantis Januarii, hora undecima Auroræ, Dominis sic decernentibus. Hodie 3a vice lecta est Billa, intituled, "An Act for naturalizing John Richard Brinckman Esquire." His Majesty's Answer to Address for Treaties. 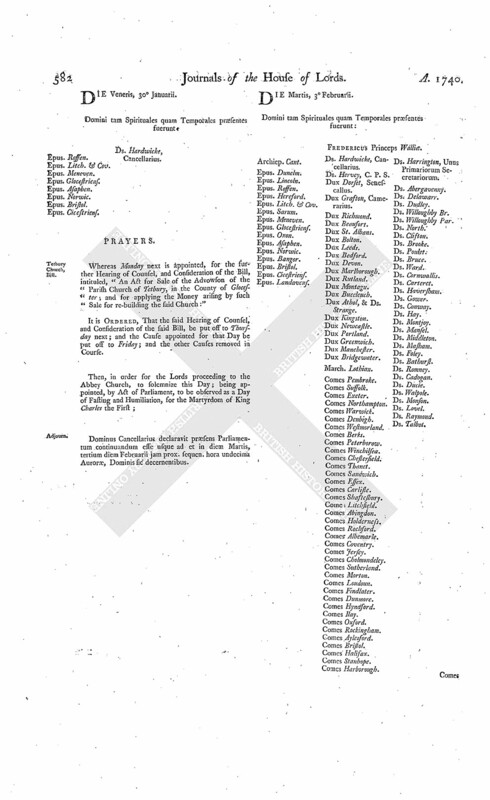 The Lord Steward reported, "That the Lords with White Staves had, pursuant to the Order of this House on Tuesday last, presented to His Majesty their Lordships Address, for Extracts of Treaties between Great Britain and any Foreign Powers, since the Accession of His late Majesty to the Crown, so far as the same relate to mutual Guaranties and Subsidies; and that His Majesty was pleased to say, He would forthwith give Order, that the Extracts desired should be laid before the House, as soon as they could be got ready." Chalie against Haswell, in Error. The Lord Chief Justice of the Court of King's Bench, in the usual Manner, brought up a Writ of Error, wherein John and James Chalie are Plaintiffs, and John Haswell is Defendant. 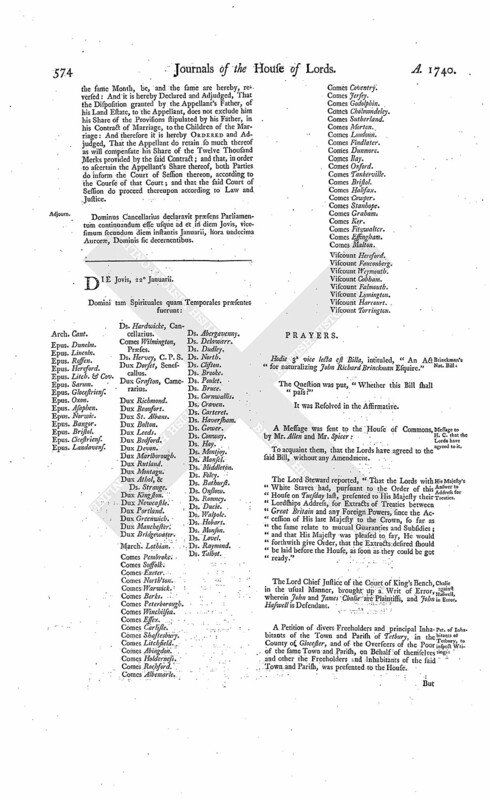 A Petition of divers Freeholders and principal Inhabitants of the Town and Parish of Tetbury, in the County of Glocester, and of the Overseers of the Poor of the same Town and Parish, on Behalf of themselves and other the Freeholders and Inhabitants of the said Town and Parish, was presented to the House. But it being insisted on, "That, before any further Proceeding be had therein, all the Lords present do take their Places:"
It was agreed by the House, that the End of the lowest Cross-bench, next the Bishops Bench, is the Place of the junior Baron. Then the abovementioned Petition was read; praying, "That the Agent for the said Trustees may be directed to permit the Petitioners Agent to inspect certain Deeds and Writings, in the Petition mentioned, relating to the Advowson of the said Parish of Tetbury." Ordered, That the Agent for the said Trustees do permit the Petitioners Agent to inspect the said Deeds and Writings; and that the same be produced, at the Bar of this House, on hearing Counsel, at the Second Reading of the said Bill. Motion for an Address relating to any Demand of the Queen of Hungary, refused. Moved, "To order, that an humble Address be presented to His Majesty, That He will be graciously pleased to acquaint this House, whether the Queen of Hungary has made any Demand of Succours, in Pursuance of Treaties; and whether that Demand was made of Men or Money." The Question was put, "Whether such an Address shall be presented to His Majesty? Order of the Day, and Cause put off. Ordered, That the said Standing Order be taken into Consideration on Tuesday next; and that the Cause appointed to be heard To-morrow be put off to Monday next. Dominus Cancellarius declaravit præsens Parliamentum continuandum esse usque ad et in diem Lunæ, vicesimum sextum diem instantis Januarii, hora undecima Auroræ, Dominis sic decernentibus. Complaint being made to the House, and Oath made at the Bar, "That James Lemon, Game-keeper to the Earl of Abingdon, was, on the 7th of this Instant January, assaulted, beaten, and abused, in an extraordinary Manner, by Robert Rogers, Richard Tuck, and Robert Tuck, which Persons, at the Time aforesaid, did enter into the Hare-warren belonging to the said Earl, in the Parish of West Lavington, in the County of Wilts, in Breach of the said Earl's Privilege, and the Privilege of this House:"
Rogers & al. to be attached, for assaulting his Game-keeper. It is Ordered, That the Serjeant at Arms attending this House, his Deputy or Deputies, do forthwith attach the Bodies of the said Robert Rogers, Richard Tuck, and Robert Tuck, and keep them in safe Custody until further Order of this House; and this shall be a sufficient Warrant on that Behalf. Sherston Magna Common, enclosing, Bill. 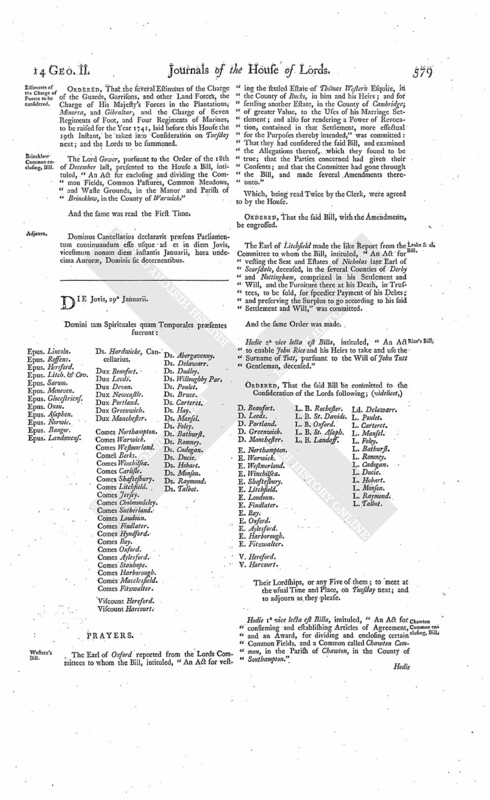 The Lord Ducie, pursuant to the Order of the 12th Instant, presented to the House a Bill, intituled, "An Act for dividing and enclosing the Common Fields lying in the Parish and Manor of Sherston Magna, in the County of Wilts." Report from the Commissioners for Greenwich Hospital delivered. The House being informed, "That Mr. Corbet, from the Commissioners for Greenwich Hospital, attended:"
"A Report of the said Commissioners, as to what Money has been received from the Derwentwater Estate, in the Year 1740; and of their Proceedings in carrying on the Building." And the Title of the said Report being read. The House was informed, "That Edward Edgworth Esquire, Respondent to the Appeal of Packington Edgworth and Mary Edgworth, has not put in his Answer thereunto, though due Service has been made of the Order of this House for that Purpose." Ordered, That the said Edward Edgworth do peremptorily put in his Answer to the said Appeal, in a Week. It is Ordered and Adjudged, by the Lords Spiritual and Temporal in Parliament assembled, That the said Petition and Appeal be, and is hereby, dismissed this House; and that the said Interlocutor therein complained of be, and the same is hereby, affirmed. Standing Order about the Committee for the Journal: Consideration put off. It is Ordered, That the said Standing Order be taken into Consideration on Wednesday next; and the Lords to be summoned. Dominus Cancellarius declaravit præsens Parliamentum continuandum esse usque ad et in diem Mercurii, vicesimum octavum diem instantis Januarii, hora undecima Auroræ, Dominis sic decernentibus. 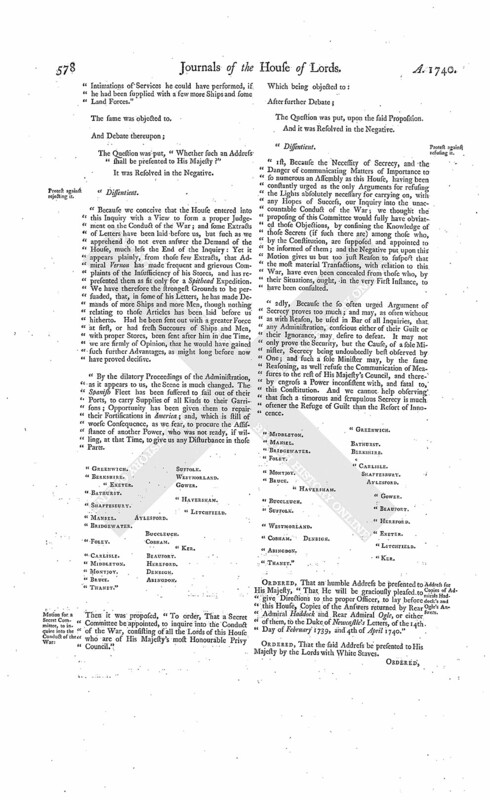 With a Bill, intituled, "An Act to amend the Law concerning Common Recoveries; and to explain and amend an Act made in the Twenty-ninth Year of the Reign of King Charles the Second, intituled, An Act for Prevention of Frauds and Perjuries, so far as the same relates to Estates pur auter Vie;" to which they desire the Concurrence of this House. 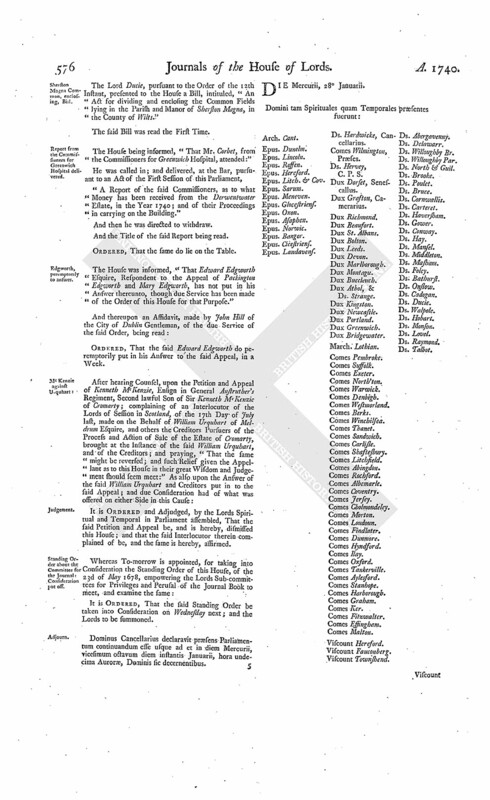 With a Bill, intituled, "An Act for enlarging the Term and Powers granted by an Act made in the Twelfth Year of the Reign of His late Majesty King George the First, intituled, An Act for repairing the Roads, in the Parishes of Kensington, Chelsea, and Fulham, and other Parishes therein mentioned, in the County of Middlesex; and for repairing some other Roads, in the Parish of St. George, Hanover Square, and the said Parishes of Kensington and Chelsea;" to which they desire the Concurrence of this House. With a Bill, intituled, "An Act to prohibit, for a Time therein limited, the Exportation of Corn, Grain (Rice excepted), Meal, Malt, Flour, Bread, Biscuit, Starch, Beef, Pork, and Bacon;" to which they desire the Concurrence of this House. 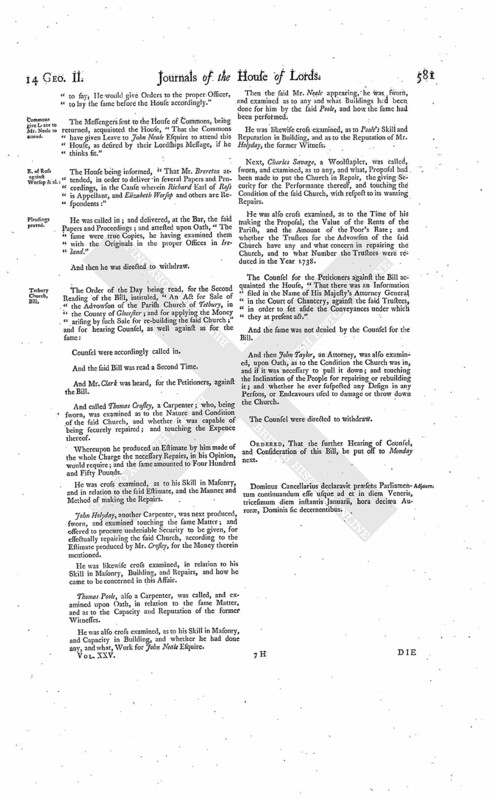 With a Bill, intituled, "An Act for confirming and establishing Articles of Agreement, and an Award, for dividing and enclosing certain Common Fields and a Common, called Chawton Common, in the Parish of Chawton, in the County of Southampton;" to which they desire the Concurrence of this House. With a Bill, intituled, "An Act for naturalizing of Gedeon Bourdillon and John David Billon;" to which they desire the Concurrence of this House. To return the Bill, intituled, "An Act for naturalizing Eve Superiori, alias Smith;" and to acquaint this House, that they have agreed to the same, without any Amendment. The Lord President, pursuant to the Order of the 13th Instant, presented to the House a Bill, intituled, "An Act to enable John Rice and his Heirs to take and use the Surname of Tutt, pursuant to the Will of John Tutt Gentleman, deceased." The Earl of Rochford reported, "That he and the Lord Viscount Torrington, pursuant to the Order of the House of the 12th Instant, had waited on Her Royal Highness the Princess of Wales, to congratulate her on the Birth of a Princess; and that her Royal Highness was pleased to say, She thanked the House, for this Mark of their Duty to the King, and Regard to her." Marks to attend Tetbury Church Bill. Ordered, That William Marks do attend this House To-morrow, when Counsel are to be heard for and against the Bill, intituled, "An Act for Sale of the Advowson of the Parish Church of Tetbury, in the County of Glocester; and for applying the Money arising by such Sale for re-building the said Church." Sir H. Clopton & al. Pet. referred to Judges. Standing Order, Committee Journal considered. It was moved, "To order, That, after the End of this present Parliament, no Entry be made in the Journals of this House, of any Appointment of Receivers and Triers of Petitions for Great Britain and Ireland." New Cross Bench to be prepared. Ordered, That a Bench be prepared, and placed between the Clerks Table and the uppermost Cross Bench; and that the Lord Great Chamberlain be desired to issue his Warrant to the proper Officers for that Purpose. Account of Duties received on Goods from Ostend and Dunkirk. Ordered, That the Commissioners of the Customs do lay before this House, an Accompt of what Sums of Money have been received, as Custom, for Goods imported from the Ports of Ostend and Dunkirk. As also, an Account of what Ships have been cleared at the Custom-house, for either of those Ports, for Five Years last past; distinguishing each Year. Moved, "To resolve, That an humble Address be presented to His Majesty, that He will be graciously pleased to give Directions to the proper Officer, to lay before this House, such Representations as have been made by Vice Admiral Vernon, in any of his Letters to His Majesty's Principal Secretary of State, or to the Commissioners of the Admiralty, in relation to the Want of more Ships or more Men; or any Intimations of Services he could have performed, if he had been supplied with a few more Ships and some Land Forces." "Because we conceive that the House entered into this Inquiry with a View to form a proper Judgement on the Conduct of the War; and some Extracts of Letters have been laid before us, but such as we apprehend do not even answer the Demand of the House, much less the End of the Inquiry: Yet it appears plainly, from those few Extracts, that Admiral Vernon has made frequent and grievous Complaints of the Insufficiency of his Stores, and has represented them as fit only for a Spithead Expedition. We have therefore the strongest Grounds to be persuaded, that, in some of his Letters, he has made Demands of more Ships and more Men, though nothing relating to those Articles has been laid before us hitherto. Had he been sent out with a greater Force at first, or had fresh Succours of Ships and Men, with proper Stores, been sent after him in due Time, we are firmly of Opinion, that he would have gained such further Advantages, as might long before now have proved decisive. "By the dilatory Proceedings of the Administration, as it appears to us, the Scene is much changed. The Spanish Fleet has been suffered to sail out of their Ports, to carry Supplies of all Kinds to their Garrisons; Opportunity has been given them to repair their Fortifications in America; and, which is still of worse Consequence, as we fear, to procure the Assisstance of another Power, who was not ready, if willing, at that Time, to give us any Disturbance in those Parts. Then it was proposed, "To order, That a Secret Committee be appointed, to inquire into the Conduct of the War, consisting of all the Lords of this House who are of His Majesty's most Honourable Privy Council." "1st, Because the Necessity of Secrecy, and the Danger of communicating Matters of Importance to so numerous an Assembly as this House, having been constantly urged as the only Arguments for refusing the Lights absolutely necessary for carrying on, with any Hopes of Success, our Inquiry into the unaccountable Conduct of the War; we thought the proposing of this Committee would fully have obviated those Objections, by confining the Knowledge of those Secrets (if such there are) among those who, by the Constitution, are supposed and appointed to be informed of them; and the Negative put upon this Motion gives us but too just Reason to suspect that the most material Transactions, with relation to this War, have even been concealed from those who, by their Situations, ought, in the very First Instance, to have been consulted. "2dly, Because the so often urged Argument of Secrecy proves too much; and may, as often without as with Reason, be used in Bar of all Inquiries, that any Administration, conscious either of their Guilt or their Ignorance, may desire to defeat. It may not only prove the Security, but the Cause, of a sole Minister, Secrecy being undoubtedly best observed by One; and such a sole Minister may, by the same Reasoning, as well refuse the Communication of Measures to the rest of His Majesty's Council, and thereby engross a Power inconsistent with, and fatal to, this Constitution. And we cannot help observing that such a timorous and scrupulous Secrecy is much oftener the Refuge of Guilt than the Resort of Innocence. Address for Copies of Admirals Haddock's and Ogle's Answers. Ordered, That an humble Address be presented to His Majesty, "That He will be graciously pleased to give Directions to the proper Officer, to lay before this House, Copies of the Answers returned by Rear Admiral Haddock and Rear Admiral Ogle, or either of them, to the Duke of Newcastle's Letters, of the 14th Day of February 1739, and 4th of April 1740." Estimates of the Charge of Forces to be considered. Ordered, That the several Estimates of the Charge of the Guards, Garrisons, and other Land Forces, the Charge of His Majesty's Forces in the Plantations, Minorca, and Gibraltar, and the Charge of Seven Regiments of Foot, and Four Regiments of Marines, to be raised for the Year 1741, laid before this House the 19th Instant, be taken into Consideration on Tuesday next; and the Lords to be summoned. The Lord Gower, pursuant to the Order of the 18th of December last, presented to the House a Bill, intituled, "An Act for enclosing and dividing the Common Fields, Common Pastures, Common Meadows, and Waste Grounds, in the Manor and Parish of Brincklow, in the County of Warwick." Dominus Cancellarius declaravit præsens Parliamentum continuandum esse usque ad et in diem Jovis, vicesimum nonum diem instantis Januarii, hora undecima Auroræ, Dominis sic decernentibus. The Earl of Oxford reported from the Lords Committees to whom the Bill, intituled, "An Act for vesting the settled Estate of Thomas Western Esquire, in the County of Bucks, in him and his Heirs; and for settling another Estate, in the County of Cambridge, of greater Value, to the Uses of his Marriage Settlement; and also for rendering a Power of Revocation, contained in that Settlement, more effectual for the Purposes thereby intended," was committed: That they had considered the said Bill, and examined the Allegations thereof, which they found to be true; that the Parties concerned had given their Consents; and that the Committee had gone through the Bill, and made several Amendments thereunto." The Earl of Litchfield made the like Report from the Committee to whom the Bill, intituled, "An Act for vesting the Seat and Estates of Nicholas late Earl of Scarsdale, deceased, in the several Counties of Derby and Nottingham, comprized in his Settlement and Will, and the Furniture there at his Death, in Trustees, to be sold, for speedier Payment of his Debts; and preserving the Surplus to go according to his said Settlement and Will," was committed. Hodie 2a vice lecta est Billa, intituled, "An Act to enable John Rice and his Heirs to take and use the Surname of Tutt, pursuant to the Will of John Tutt Gentleman, deceased." V. Harcourt. L. B. Rochester. Hodie 1a vice lecta est Billa, intituled, "An Act for confirming and establishing Articles of Agreement, and an Award, for dividing and enclosing certain Common Fields, and a Common called Chawton Common, in the Parish of Chawton, in the County of Southampton." Hodie 1a vice lecta est Billa, intituled, "An Act for enlarging the Term and Powers granted by an Act made in the Twelfth Year of the Reign of His late Majesty King George the First, intituled, An Act for repairing the Roads, in the Parishes of Kensington, Chelsea, and Fulham, and other Parishes therein mentioned, in the County of Middlesex; and for repairing some other Roads, in the Parish of St. George, Hanover Square, and the said Parishes of Kensington and Chelsea." Hodie 1a vice lecta est Billa, intituled, "An Act for naturalizing of Gedeon Bourdillon and John David Billon." Houseman, to be added to Nat. Bill. Then the said Mathew Houseman took the Oaths appointed, in order to his Naturalization. 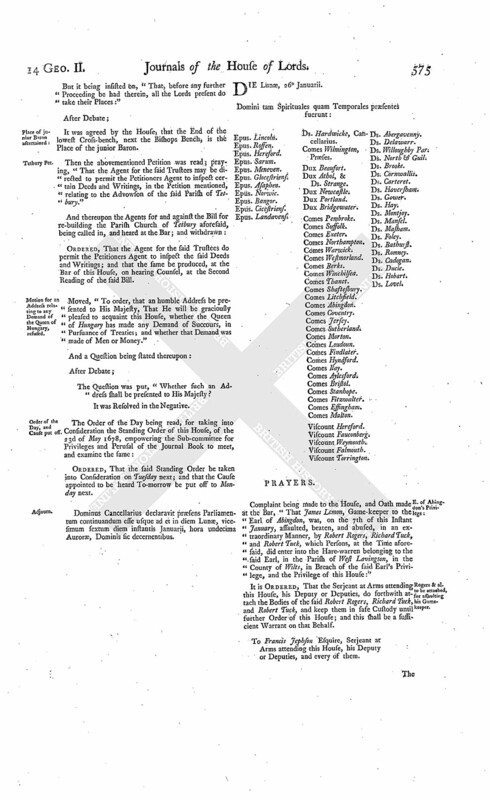 With a Bill, intituled, "An Act for making the Chapelry of Nether Knutsford, in the Parish of Rosthern, and County of Chester, a separate and distinct Parish; and for erecting a Parish Church therein, endowing the same, settling the Right of Presentation thereto, and other Purposes;" to which they desire the Concurrence of this House. Sherston Magna Common enclosing, Bill. Hodie 2a vice lecta est Billa, intituled, "An Act for dividing and enclosing the Common Fields lying in the Parish and Manor of Sherston Magna, in the County of Wilts." Their Lordships, or any Five of them; to meet at the usual Time and Place, on Friday the 13th Day of February next; and to adjourn as they please. Pitcairn's Pet. to put off his Cause rejected. Upon reading the Petition of Alexander Pitcairn; praying, "In regard the Petitioner has Occasion for Extracts of some Proceedings in Scotland; that the Hearing of his Appeal, which stands for Monday next, may be put off to the 16th of February." Whereupon the Agents on both Sides were called in, and heard. Hodie 1a vice lecta est Billa, intituled, "An Act to amend the Law concerning Common Recoveries; and to explain and amend an Act made in the Twentyninth Year of the Reign of King Charles the Second, intituled, An Act for Prevention of Frauds and Perjuries, so far as the same relates to Estates pur auter Vie." Hodie 1a vice lecta est Billa, intituled, "An Act to prohibit, for a Time therein limited, the Exportation of Corn, Grain (Rice excepted), Meal, Malt, Flour, Bread, Biscuit, Starch, Beef, Pork, and Bacon." Ordered, That the Hearing of the Cause wherein Alexander Pitcairne Gentleman is Appellant, and Patrick Crichton Respondent, be put off to this Day Sevennight. Curtain to be provided at the Bar. Ordered, That a Curtain be provided, to hang at the Bar of this House, to keep off the Wind from the Lords; and that the Lord Great Chamberlain be desired to issue his Warrant to the Officers of His Majesty's Wardrobe for that Purpose. The Duke of Portland, pursuant to the Order of the 7th Instant, presented to the House a Bill, intituled, "An Act for making a Chapel, lately built by John Coppin Esquire, in the Parish of Cadington, in the County of Hertford, a perpetual Cure and Benefice; and for other Purposes therein mentioned." 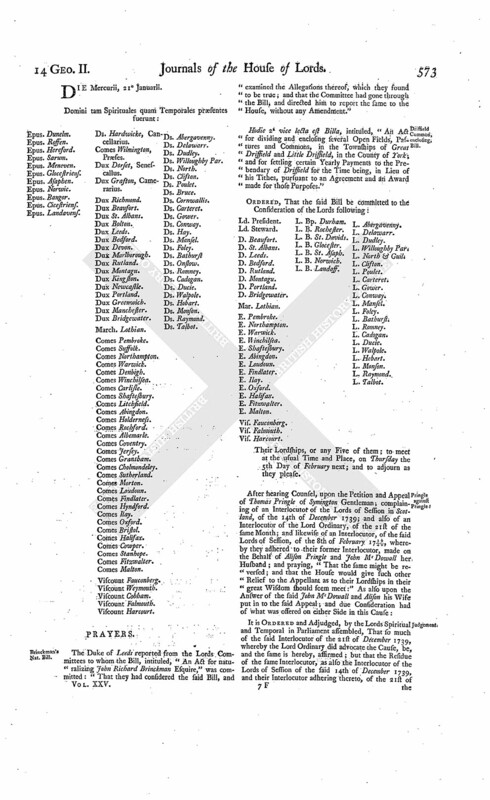 The House being moved, "That a Day may be appointed, for hearing the Cause wherein Patrick McKattie is Appellant, and John Frigg and James Fraser are Respondents:"
Hodie 2a vice lecta est Billa, intituled, "An Act for enclosing and dividing the Common Fields, Common Pastures, Common Meadows, and Waste Grounds, in the Manor and Parish of Brincklow, in the County of Warwick." Message to H. C. for Mr. Neale to attend Tetbury Church Bill. Ordered, That a Message be sent to the House of Commons, "To desire, that they will give Leave that John Neale Esquire, a Member of that House, may attend this House, to be examined, as a Witness upon the Bill, intituled, "An Act for Sale of the Advowson of the Parish Church of Tetbury, in the County of Glocester; and for applying the Money arising by such Sale for re-building the said Church." And a Message was accordingly sent, by Mr. Edwards and Mr. Allen, for that Purpose. King's Answer to Address for Answers from Admirals Haddock and Ogle. The Earl Fitzwalter reported, "That the Lords with White Staves had (according to Order) presented to His Majesty the Address of this House Yesterday, for Copies of Answers written by the Rear Admirals Haddock and Ogle, to Two of the Duke of Newcastle's Letters; and that His Majesty was pleased to say, He would give Orders to the proper Officer, to lay the same before the House accordingly." Commons give Leave to Mr. Neale to attend. The Messengers sent to the House of Commons, being returned, acquainted the House, "That the Commons have given Leave to John Neale Esquire to attend this House, as desired by their Lordships Message, if he thinks fit." The House being informed, "That Mr. Brereton attended, in order to deliver in several Papers and Proceedings, in the Cause wherein Richard Earl of Ross is Appellant, and Elizabeth Worsop and others are Respondents:"
And the said Bill was read a Second Time. And Mr. Clark was heard, for the Petitioners, against the Bill. And called Thomas Crosley, a Carpenter; who, being sworn, was examined as to the Nature and Condition of the said Church, and whether it was capable of being securely repaired; and touching the Expence thereof. Whereupon he produced an Estimate by him made of the whole Charge the necessary Repairs, in his Opinion, would require; and the same amounted to Four Hundred and Fifty Pounds. He was cross examined, as to his Skill in Masonry, and in relation to the said Estimate, and the Manner and Method of making the Repairs. John Holyday, another Carpenter, was next produced, sworn, and examined touching the same Matter; and offered to procure undeniable Security to be given, for effectually repairing the said Church, according to the Estimate produced by Mr. Crosley, for the Money therein mentioned. He was likewise cross examined, in relation to his Skill in Masonry, Building, and Repairs, and how he came to be concerned in this Affair. Thomas Poole, also a Carpenter, was called, and examined upon Oath, in relation to the same Matter, and as to the Capacity and Reputation of the former Witnesses. He was also cross examined, as to his Skill in Masonry, and Capacity in Building, and whether he had done any, and what, Work for John Neale Esquire. Then the said Mr. Neale appearing, he was sworn, and examined as to any and what Buildings had been done for him by the said Poole, and how the same had been performed. He was likewise cross examined, as to Poole's Skill and Reputation in Building, and as to the Reputation of Mr. Holyday, the former Witness. Next, Charles Savage, a Woolstapler, was called, sworn, and examined, as to any, and what, Proposal had been made to put the Church in Repair, the giving Security for the Performance thereof, and touching the Condition of the said Church, with respect to its wanting Repairs. 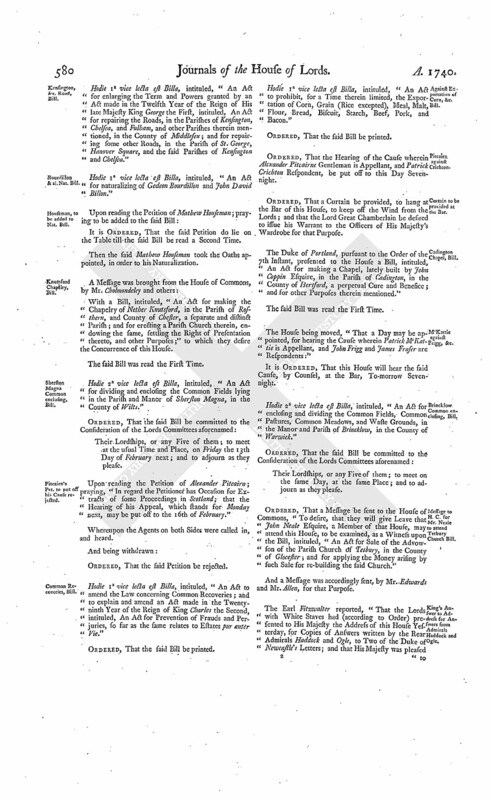 He was also cross examined, as to the Time of his making the Proposal, the Value of the Rents of the Parish, and the Amount of the Poor's Rate; and whether the Trustees for the Advowson of the said Church have any and what concern in repairing the Church, and to what Number the Trustees were reduced in the Year 1738. The Counsel for the Petitioners against the Bill acquainted the House, "That there was an Information filed in the Name of His Majesty's Attorney General in the Court of Chancery, against the said Trustees, in order to set aside the Conveyances under which they at present act." And the same was not denied by the Counsel for the Bill. And then John Taylor, an Attorney, was also examined, upon Oath, as to the Condition the Church was in, and if it was necessary to pull it down; and touching the Inclination of the People for repairing or rebuilding it; and whether he ever suspected any Design in any Persons, or Endeavours used to damage or throw down the Church. Ordered, That the further Hearing of Counsel, and Consideration of this Bill, be put off to Monday next. Dominus Cancellarius declaravit præsens Parliamentum continuandum esse usque ad et in diem Veneris, tricesimum diem instantis Januarii, hora decima Auroræ, Dominis sic decernentibus. Domini tam Spirituales quam Temporales præsentes fuerunt. Whereas Monday next is appointed, for the further Hearing of Counsel, and Consideration of the Bill, intituled, "An Act for Sale of the Advowson of the Parish Church of Tetbury, in the County of Glocester; and for applying the Money arising by such Sale for re-building the said Church:"
It is Ordered, That the said Hearing of Counsel, and Consideration of the said Bill, be put off to Thursday next; and the Cause appointed for that Day be put off to Friday; and the other Causes removed in Course. Dominus Cancellarius declaravit præsens Parliamentum continuandum esse usque ad et in diem Martis, tertium diem Februarii jam prox. sequen. hora undecima Auroræ, Dominis sic decernentibus.